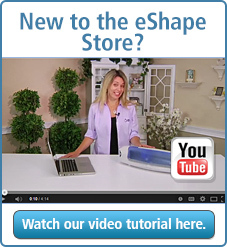 Welcome to the Sizzix eshape Store! Here you can select from stylish shapes and fonts for all your papercrafting projects with Sure Cuts A Lot and eCAL software. All cut files from our eshape Store are easy to buy and download for your Sizzix eclips machines and other electronic cutters. The designs are like your typical SVG files, but are protected to work exclusively with your SCAL and eCAL software. We even have FREE shapes for you to get started right now!